Suspended in the air! Yeah, you can believe in your eyes. It is not an optical illusion. This nickel curved chain uses the laws of physics (center of gravity) and achieves to stay at that form. A cool wine gadget to amaze your guests. 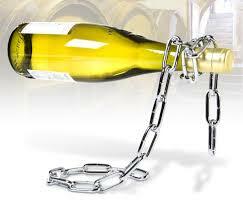 The Chain Wine Bottle Holder is a gravity defying eye catcher, and a great way to show off your vino. Made from welded chain links and cleverly designed so as to balance perfectly when you add your wine bottle of choice, it's like having a piece of installation art on your dining table.